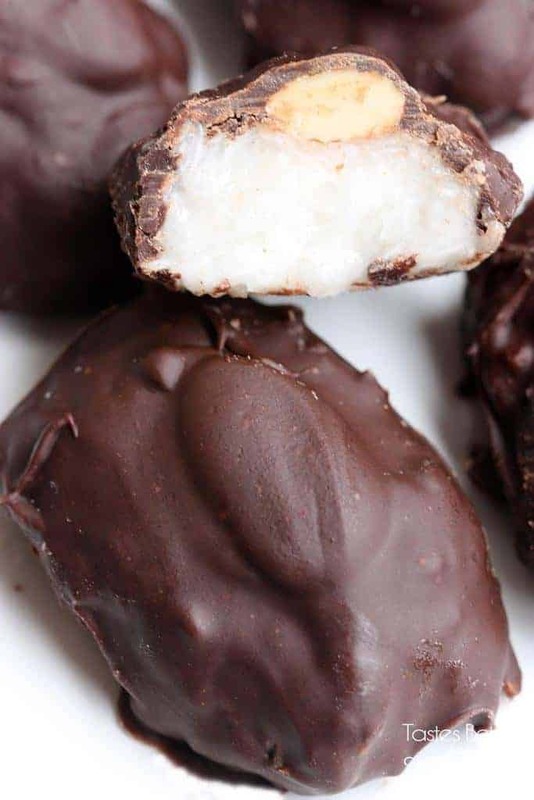 Homemade Almond Joys is a chocolate treat filled with coconut and a roasted almond. And the best part, it’s only 5-ingredients! When I was pregnant with Jackson I would always wear one of his coats around and I’d always find candy in the pockets. 🙂 I’m not complaining…I think it’s adorable. BUT, when I’m hankering for a sweet tooth at night, I want some cookies, and he wants skittles, or milky ways! 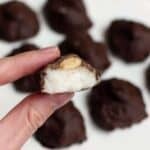 The first time I made these Homemade Almond Joys I thought he was going to die of happiness. 🙂 These are the easiest ever to make, and they’re totally amazing! So, my sweetheart will definitely be getting some on Valentine’s Day! 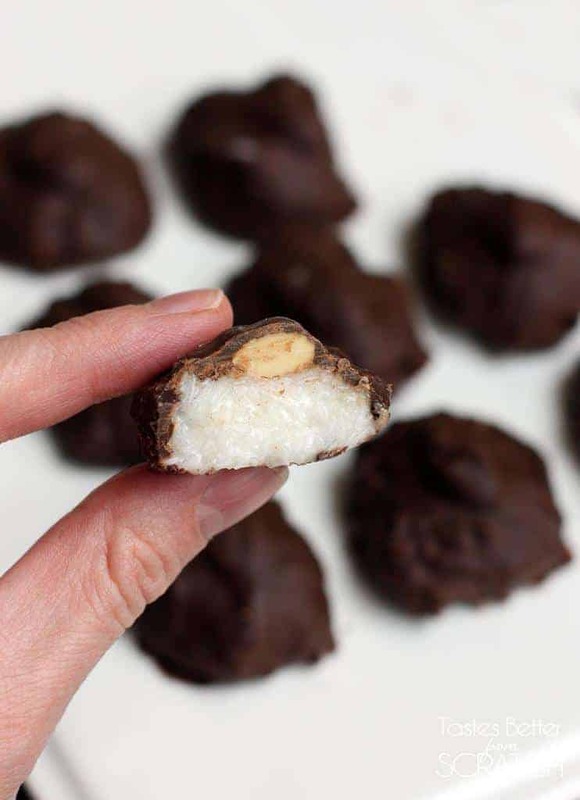 I love how easy these Almond Joy’s are – Five simple ingredients! 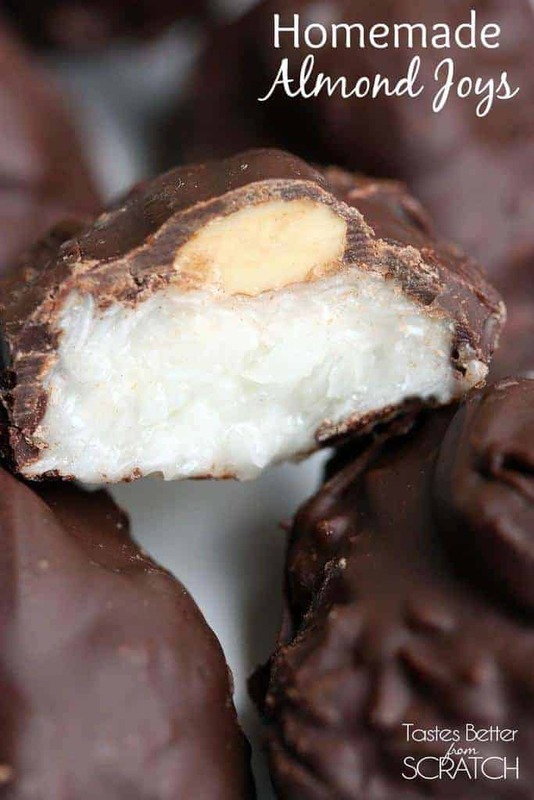 Homemade Almond Joys is a chocolate treat filled with coconut and a roasted almond. And the best part, it's only 5-ingredients! In a medium saucepan add the syrup, marshmallows, and salt and cook over medium heat, stirring constantly, until the marshmallows are melted. Stir for about a minute longer. Remove from heat and stir in coconut and vanilla. Transfer to a bowl and refrigerate for at least 1 hour, or until well cooled. (This part could be made days in advance). Remove mixture from the fridge. Roll mixture into small logs, about the size of a fat tootsie roll. 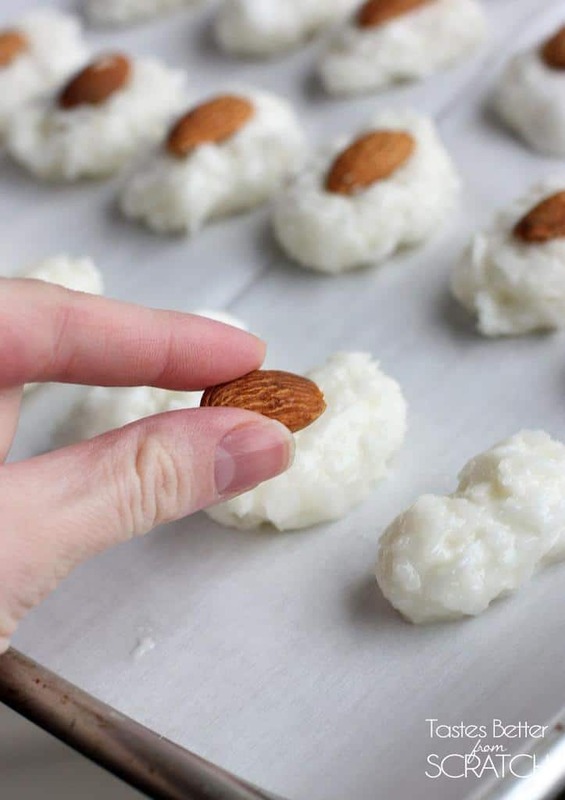 Place an almond on top of each, pressing it down so it sticks. Place parchment paper on a cookie sheet and place in the freezer while you melt the chocolate. Melt chocolate slowly in the microwave, stirring often, or in a double boiler. (I just place a mixing bowl over a pot of simmering water and stir the chocolate until it melts). 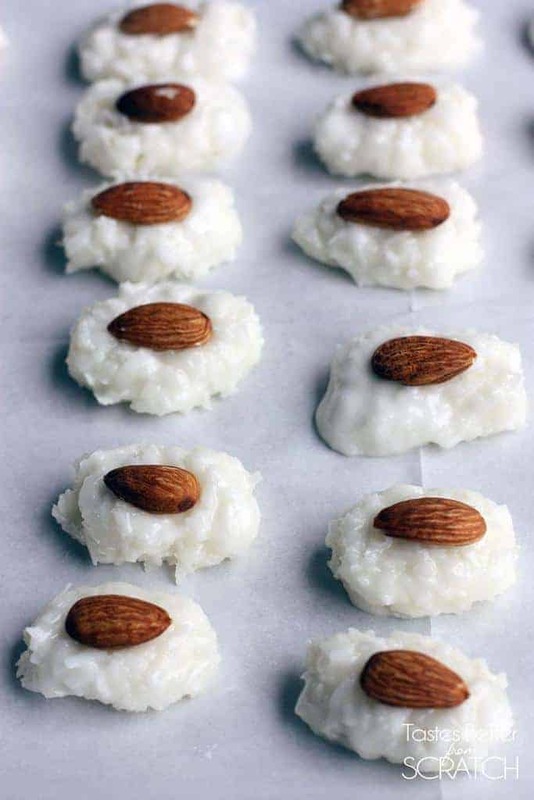 Dip each coconut roll into the melted chocolate and place on the cold, parchment lined cookie sheet. Allow the chocolate to set. (You could also stick them back in the fridge at this point). Enjoy! Mmmm. My son would really think I’m super mom if I made these. Is the coconut sweetened or unsweetened? Thanks! OMG . . . these are dangerous 🙂 I would eat the entire batch by myself!! These definitely don’t taste like Almond Joys. The marshmallows don’t belong. I’m sure that plenty of people would like them, especially if you like marshmallow. The texture is good, too. Just know that they don’t taste like almond joys. I don’t think you can call this “gluten free” if it is made with corn syrup. Karo syrup is gluten free as stated in the bottle . I’m making these for my family! Once made, how do you recommend storing them? Air tight container or are treat boxes okay? Should they be kept in the fridge or is room temp okay? Thanks! Hi Amanda, hope you love them! I would store them in an airtight container in the fridge. I made 2 batches of these and sent with my husband to deer camp, gave a few to my parents to let my dad critique (we like to do that) , and saved a few for myself. Everyone LOVED them!! My dad said they taste so much like almond joys but even better and creamier. I agree!! They are so so good! I love almonds so I added extra to mine but left them out of a few for the ones who don’t. THanks for the recipe. I will be adding these to my Christmas platters this year!! Since it is so finely ground and not as sweet, it may not turn out great. I haven’t tried though and I’d love to know if you had success with it!